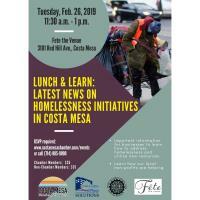 The Costa Mesa Sanitary District (CMSD) is inviting applications to the Citizens Advisory Committee (CAC). 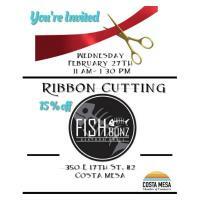 Fishbonz cordially invites you to their Ribbon cutting ceremony! Join us as we celebrate their grand opening and welcome in this new and exciting restaurant in town! Fishbonz will be serving healthy, delicious, fresh dishes with 25% off! 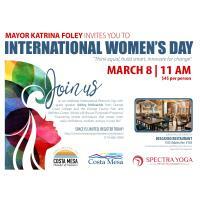 International women?s luncheon JOIN US as we celebrate International Women's Day with guest speaker Ashley Mckeachie from Orange Coast College and the Orange County Pain and Wellness Center. Ashley will discuss ''Purposeful Presence'', ''Examining simple techniques that create more daily confidence, wisdom, and joy in your life'' Space is LIMITED, REGISTER TODAY! Graduating class of 2019 exploring careers in the beauty industry. A Whole New Brunch Experience Begins at Descanso... Starting March 30th, 2019!